IMSA offers professional development sessions on mathematics, science, technology, and pedagogy for pre-service and in-service educators and administrators. These professional development opportunities align with IMSA’s signature strategy of learning: Inquiry-Based, Problem-Centered, Competency- Driven and Integrative. Professional learning opportunities include events held at IMSA, sessions presented at conferences, and workshops delivered in schools across the state and beyond. Educator workshops can be customized to meet any school’s specific needs. The IMSA FUSION Program is a school-based STEM enrichment program for Illinois students who are talented, interested and motivated in mathematics and science. IMSA FUSION places a special emphasis on students who are historically under-resourced and underrepresented in these areas. 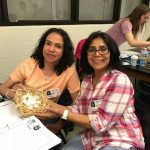 The program provides materials for teaching/implementing units and ongoing professional development and support for the participating Illinois teachers and administrators. The Illinois Mathematics and Science Academy is the Regional Partner for Code.org for all areas in Illinois outside of the city of Chicago. Through this partner ship we provide professional learning using Code.org’s curriculum at the elementary, middle school, and high school levels. The Science Teacher as Scientist teacher externship program places teachers in local businesses and industries to see STEM in action. 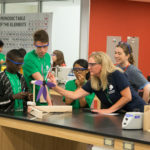 During the summer, educators work side-by-side with knowledgeable and skilled industry employees learning real world skills and applications in STEM areas. Following the externship, teachers work with the curriculum development team at IMSA to create innovative curriculum units connecting their state standards to their externship experience. 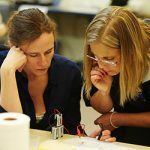 Externships provide business partners skilled teachers that can make significant contributions to work done in a lab, out in the field, or on any workplace team. Additionally, teachers will take back innovative teaching ideas and learning experiences to their students which will create more career ready graduates who can contribute to the local workforce. Little STEAMers is a Science, Technology, Engineering, Arts and Mathematics (STEAM) based curricular program for preschool children ages 3 to 5. Designed to offer integrative learning experiences for young students, Little STEAMers seeks to fill the need for connected, holistic learning opportunities that encourage academic and intellectual growth within the preschool classroom.